His name is Karpal Singh. No, not the late DAP stalwart who for ages commandeered his political fortress in Jelutong, Penang, but Karpal Singh the cab driver here in Kuala Lumpur. Karpal was in the mood to talk that morning and talk he did as soon as I closed the door of his surprisingly tidy cab after leaving my car to undergo its regular maintenance service at the edge of town. He even went as far as adjusting the rearview mirror so that he could see me at the back as he was talking. Since it seemed that he preferred to do all the talking, I chose just to listen while taking down notes in my mind. Karpal had spent four years of his life some time ago driving a cab in Toronto, Canada. He did so in between doing some work for another company. His son is still there now. From my past encounters with taxi drivers in Kuala Lumpur, at least eight out of 10 had mostly grouses towards everything under the sun. Karpal was no exception, except that this time I thought he had a point. Although we were caught in a horrendous rush hour traffic that morning, Karpal’s ire had little to do with traffic. He had his smartphone connected to his car sound system, telling me that he had to resort to tuning in to Internet radio because there wasn’t any Punjabi radio station in Malaysia. He wondered why. “We, Punjabis, have been here for many years brother, but we don’t even have one radio station,” he lamented, before going on with mentioning the dozens of radio stations in languages of the other races in Malaysia. I grew up with Punjabis being a familiar sight. In fact, I still have several Punjabi friends. There was a rather large community of them in Port Dickson where I grew up in the 1960s and in nearby Seremban. They were some of the wealthiest businessmen around at the time and, for some reason, controlled the bus and lorry companies. In fact, one of the earliest bus companies I got accustomed to was the Utam Singh bus company plying the Seremban-Port Dickson route. Unfortunately, like most stage bus companies, it has since ceased to operate. By and large, while most Punjabis I knew were big-sized people, all of them were pleasant and mild mannered. But somehow, I have always associated Punjabis with hockey because all my Punjabi male friends were skillful hockey players. Karpal’s estimate puts the population of Punjabis in Malaysia at 100,000 and he claimed the number to be declining as many have opted to leave Malaysia in search of greener pastures. Like many others, I was often confused initially between the term “Punjabi” and “Sikh” and it was only later that I learnt that Sikh is a religion while Punjabi is a term used for the people from the Punjab region of both India and Pakistan, irrespective of their religions. So, it must mean that not all Punjabis are Sikhs. 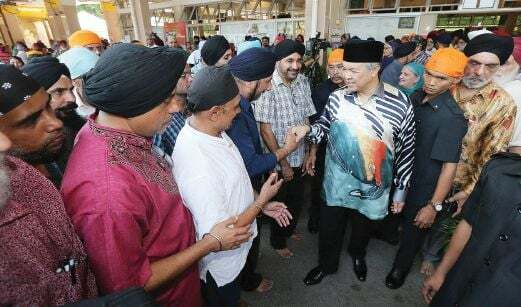 Like other races in Malaysia, the Punjabis came here generally to make a living, although history has it that the earliest arrivals came to the then Straits Settlement as prisoners from the Punjab region. Later, however, they became more well known as police officers and served the then British colony, including Malaysia as the country is known now, gallantly. Later, Punjabis in other activities, such as cattle breeding and transport operators, followed suit. Later generations of Punjabis have become successful in mainstream development, including becoming top officials in the legal and medical professions as well as in politics, as demonstrated by Karpal’s namesake in Penang. I asked Karpal why he decided to come back after his stint in Canada. Toronto is, after all, not at all a bad place to live in, except maybe, for someone more accustomed to the Malaysian weather, during the winter months. Karpal had much admiration for Toronto, saying he had to undergo rigorous tests before being awarded a permit to drive a taxi there. Getting the permit is one thing, maintaining it is another, he said, as commuters in the city take their rights to a good service seriously. He said cab drivers must keep their taxis clean, and always observe traffic rules and not put lives of their passengers at risk. “One complaint and we will be hauled up both by the taxi company as well as the authorities,” he said. But, after four years in Canada, Karpal said he missed home and decided to return to Malaysia. Despite what he saw as shortcomings relative to what he experienced during the four years he was driving a cab in Toronto, Karpal said Malaysia was home, and all things considered, remained a place where he would want to grow old in. But, he needed the Punjabi radio station though, not at all satisfied that although he was able to listen to stations playing Punjabi songs that had appeared in Bollywood movies, the hosts spoke in Tamil. “Besides, they seldom air the latest songs,” he said.